Appraisal – The process of estimating or setting the market value of a piece of property, partially based on an analysis of comparable sales of similar homes in the area. An appraisal usually takes the form of a written report. Appraisals are usually required during the mortgage loan approval process. Commission – Compensation paid to real estate professionals for services rendered in connection with the sale or exchange of real property. Comparative Market Analysis (CMA) – An in-depth analysis of nearby comparable home sales done by a real estate agent to estimate a home’s market value, usually performed to help select the most appropriate sale price. Contingencies – Conditions written into a real estate contract that specify that the contract will cease to exist in the event of certain conditions. Contingencies, like requiring an acceptable property inspection report within a certain time period, must be met for a contract to be legally binding and carried out as written. Contract – An oral or written agreement between competent parties who agree to perform or refrain from performing a certain thing. In real estate there are many different types of contracts, including listings, contracts of sale, options, mortgages, assignments, leases, deeds, escrow agreements, and loan commitments, among others. Deed – A written, legal document that conveys or transfers property. Escrow – The process in which an item of value, money or documents is deposited with and held by a trusted third party to be delivered upon the fulfilment of a condition. For example, the earnest money deposit is put into escrow the transaction is closed, at which time it is delivered to the seller. Foreclosure – The process of taking possession of a mortgaged property as a result of a failure to keep up with timely mortgage payments. This can involve a forced sale of the property at public auction after which the proceeds of the sale are applied to the mortgage debt. Home Inspection – A thorough inspection by a qualified professional who evaluates the structural and mechanical condition of a home. A home inspector may assess the condition of a property’s roof, foundation, heating and cooling systems, plumbing, electrical work, water and sewage and some fire and safety issues. In addition, the home inspector will look for evidence of issues that may affect the value of the property. Homeowner’s Insurance – An insurance policy that combines personal liability insurance and hazard insurance coverage for a dwelling and its contents, often required by mortgage lenders. 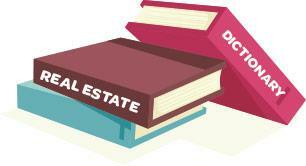 Lien – A legal claim against the property as a result of a debt that must be paid off when the property is sold. Mortgage – A legal document that specifies a temporary, conditional pledge of a property to the lender/creditor as security for the repayment of a debt, in this case a home loan. Pre-approval – Pre-approval is a loosely used lending term that usually implies that a buyer has already talked to a lender. The lender has, in turn, checked the buyer’s credit history and income to determine that they will be able to get a loan up to a certain amount. The pre-approval helps a buyer find a home within their price range and submit a strong offer. Short Sale – A short sale occurs when a property is sold at a moderate loss, as an alternative to foreclosure. The home is listed at a price lower than the amount owed on the mortgage. Buying a short sale home can require approvals from multiple lenders. Title – A legal document evidencing a person’s right to or ownership of a property. A title report, often done by a title insurance company after an offer has been accepted, will show the history of the title as well as applicable encumbrances such as easements or liens.